This blog records my journey to Hereditary Spastic Paraplegia (HSP, also known as Familial Spastic Paraparesis or FSP). I was diagnosed with SPG4 in 2009 when my wife became pregnant with our first child. I currently wear insoles, do daily stretches and weekly Pilates. I take medication for my bladder. I tweet about HSP, RareDisease and other things @munkee74. We're not far from my eldest's 10 year birthday, which means that I'm now at diagnosis plus 10 years. Back at the end of March 2009 I met with the genetics counsellors and they took a blood sample. This was analysed quickly and we found out that I had HSP early April 2009 (the results letter was written on 2nd April 2009). So, This post marks the first 10 years on my HSP journey, and I thought about reflecting on what has changed and what I have learnt in that time. So, over the last 10 years there have been some physical changes. Some of these are due to getting older and some are due to having HSP, and there is a likely middle ground where some could be either way. So, my weight is about the same, my hair is getting grey-er and is receding back across my head, and my eyesight is getting poorer. On the other side, my hearing is about the same, I've similar strength and my sleeping patterns are about the same (subject, of course to now having 2 children!). I group these into the getting older camp. Prior to diagnosis I could run - my longest run was the Bristol 10km in the mid 2000's. I find it difficult to run more than a short distance now. Back in the day I was also a keen hill walker, making it up to the Lake District a few times a year to regularly walk upwards of 20km a day in the fells. This would be much more of a challenge these days. I am now cycling more than I used to, but I feel that my length without pausing is decreasing. The other main physical change is my gait and range of muscle movement when walking and moving. I'm getting through shoes quickly, because my feet scrape on the floor, and I cannot move my legs as far as I could in many different directions! Back 10 years ago I thought I knew a fair bit about HSP, but in reality I knew very little. Regular readers will have spotted that I now keep my eyes out on many different channels to spot relevant things. 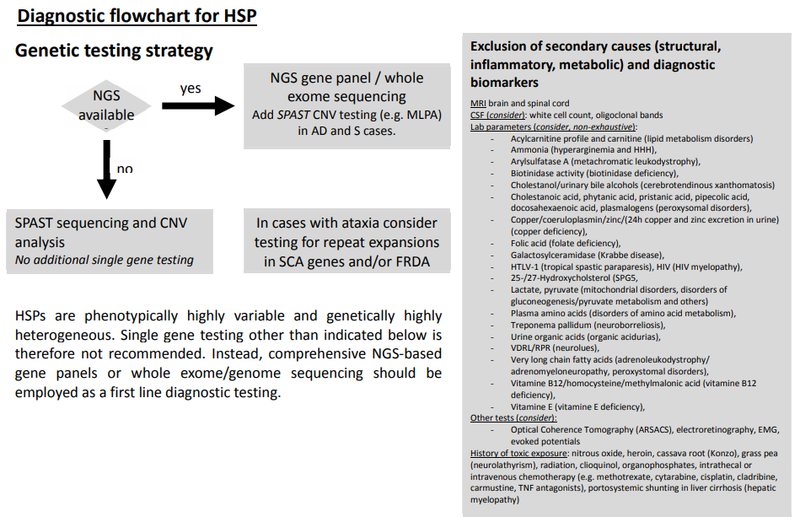 My knowledge of HSP has increased considerably, although many of the researchers are working at a technical depth that I still do not appreciate. The other key knowledge area is how our health system works, and what I have to do to get what I want/need. This is more difficult than I was expecting, but I can see the parallels between my work and how the NHS works with pressures being applied to get more done without additional resources. The other knowledge I've gained has been with the help of you readers of this blog, by contributing your information to my surveys I have learnt a lot about the wider experiences of people across the world. This has helped my understanding of how similar or different my HSP journey is from others, and has helped my understand where there are gaps in the overall HSP knowledge area. I have also learnt a lot about how charities are run and the responsibilities of being a trustee for a charity, and recently about being the chair of a charity. This has opened up a load more information and connections with others with HSP. Here we are in the area of known knowns, known unknowns and so on. I've been doing weekly Pilates for about 9 years and I've been taking medication for about 6 years. This has set me back about £3000 in total, currently about £400/year. I have had travel costs to appointments which I've not tracked - although most have been zero cost as I've cycled to local hospital appointments. I have also been getting through socks and shoes quicker than I used to, which is another untracked differential cost. The other two costs are more subjective - time and wellbeing. My hourly pilates and daily stretches and appointments have taken about 38 days time in total (about 900 hours). the equivalent of perhaps 3-4 working weeks a year for dealing with my survey and analysis. That lot adds up to 90 days time in total (2135 hours), with a big step change at the start of my surveys, and another step change when I became chair of the HSP group. In terms of wellbeing I'm fairly resilient. My knowledge has helped reduce my anxiety, but I have been a bit depressed at times over this decade. Of course there are many factors which affect this and it would be unfair to blame all my depression on HSP. I'm not going to fall into the trap of setting myself objectives for the next 10 years. Things will be very different then - I'll be sharing my house with 2 young adults instead of 2 primary school aged boys. I'm expecting that there will be further deterioration in my mobility, but I'm not going to speculate on that. I hope to still be blogging and finding out more information to post about. I'll be 10 years closer to retirement. Whats left of my hair will most likely be grey and I expect to be wearing glasses. Hopefully my hearing will stay intact. One story caught my eye earlier, that the human brain may regrow nerve cells throughout its life. So I only see this as a news story (https://www.sciencenews.org/article/new-nerve-cells-adult-brains) Re-growth of nerves sounds very positive - of course, for HSP we'd be after the very long nerves rather than just those in the brain. This flow chart first asks if you have gene panels or genetic sequencing available. If you have then use this, otherwise only test for SPAST/SPG4 (unless you additionally have ataxia). Beyond this it is a diagnosis of exclusion - and a long list of tests which could be done and other things to look at have been suggested to end up with an HSP diagnosis if all other things have been excluded. Some of you may use Gabapentin or Pregabalin for your HSP. If you're reading in the UK these two are changing their classifications, they will (from 1st April) be "schedule 3 controlled drugs" which means that you may have more difficulty getting hold of this medicine. It seems that additional information needs to be given on the prescription, the amount you can receive may be reduced, and getting repeat prescriptions may be more tricky. It seems like a busy time for HSP research at the moment. Readers may be aware that I published a post recently about my most interesting papers from 2018 (https://hspjourney.blogspot.com/2019/01/2018-hsp-research-overview.html). There are a number of other interesting things which have come out since then. This post covers one. My summary is that there isn't much data out there which supports the approaches being used on a day-to-day basis to treat HSP. I find it interesting that there is no report of oral baclofen, tizanidine or diazepam are included, and the overall conclusions that there are not many studies is also borne out as there is no discussion on treatment of the other HSP symptoms - pain, continence or studies showing treatments like physiotherapy or walking aids improving things. There currently exist no specific therapies for HSP, and treatment is exclusively symptomatic, aimed at reducing muscle spasticity, and improving strength and gait. The authors set out to perform a comprehensive systematic review of the available scientific literature on the treatment of HSP, Two authors independently analyzed 27 articles selected on the basis of a series of inclusion criteria. The 27 articles focused on pharmacological treatment (n = 17 articles), physical therapy (n = 5), surgical treatment (n = 5). Gabapentin is an antiepileptic and antinociceptive drug. To evaluate its antispastic action, gabapentin was tested in a double-blind, prospective, crossover placebo-controlled trial in patients with SPG4-linked hereditary spastic paraplegia. Ten adult patients were included. Overall, no statistically significant clinical differences were found between gabapentin and placebo. The quality was rated as good, however the assessors urged caution, given the very small size of the sample considered. Progabide is a highly selective GABA receptor agonist. In a double-blind crossover trial involving two 14-day treatment periods, progabide was compared with placebo in 16 adults with spasticity, two of whom had a clinical diagnosis of HSP (with an unspecified molecular etiology). Outcome measures were: spastic hypertonia, reflex responses and flexor spasms . Progabide was found to significantly reduce spastic hypertonia, reflex responses and flexor spasms. The quality of this study was rated as moderate. However, only two patients had an HSP-related form of spasticity. Furthermore, the treatment was short-term and the selected outcomes were not clinically significant. Dalfampridine is a voltage-dependent potassium channel blocker used to improve walking ability in patients with multiple sclerosis. We reviewed two prospective, uncontrolled, open trials. The first study included 12 adult patients affected by HSP who were treated for 15 days. After treatment, patients were categorized into two groups: “responders” (n = 6 patients), who showed an improvement of >20% in any of the three tests (TWT, SPRS, and MSWS-12), and “non-responders” (n = 6 patients), who by definition recorded improvements of < 20% in all tests. However, these results must be interpreted with caution for several reasons: no control group was included and no information was given on the HSP patients' phenotype (pure/complex) or disease duration, and their molecular etiology thus remained uncertain. Overall, the quality of this trial was rated as low (8/22). The second study enrolled five adult patients, all with definite HSP: four with an SPG4 form, and one with an SPG15 form. Dalfampridine, 10 mg, was administered orally twice daily for 15 days. Patients exhibited significantly improved assessment scores. This trial was uncontrolled and the sample size small, and overall its quality was considered low (7/22). Recently, six patients with SPG11 received 10 mg dalfampridine twice daily for 12 months. A global improvement in motor function was observed and less fatigue was reported. The patients showed an improved ability to concentrate. Intramuscular injection of botulinum toxin type-A (BoNTA) is one of the primary treatments for focal spasticity. In an uncontrolled clinical trial, 15 adults with confirmed HSP were treated with BoNTA injections in each triceps. This was followed by 18 weeks of daily stretching exercises. After treatment, mean comfortable gait velocity increased significantly, whereas balance and the other functional measures remained unchanged. The quality of this study was low (6/22). In another study involving 19 unselected adult patients with a probable diagnosis of HSP, treated with BoNTA showed some improvements. In a retrospective study 10 patients with HSP received BoNTA and physical therapy for 5 years. Over time they showed significant improvements both in muscle tone and in baropodometric examination parameters. Overall, the quality of these latter case studies was very low. Two siblings (aged 16 and 18 years). Two studies described five additional subjects with HSP resulted in a partial improvement of motor symptoms. A mother and a daughter with SPG8 whose spasticity improved after L-Dopa therapy. These studies were considered anecdotal, and of barely acceptable quality. SPG5 is a rare subtype of HSP. In one study, two adult siblings were treated with cholesterol-lowering agents: one received simvastatin for the first 12 months, after which ezetimibe was used in combination with simvastatin for a further year. His sibling received only ezetimibe for 12 months. In both patients an SPG5 biomarker significantly decreased, whereas muscle strength scores did not change. The quality of this study was rated as very low (2/22). In a more complex study in SPG5, atorvastatin was used for 9 weeks in 14 patients and the primary endpoint was a reduction in serum 27-OHC levels. Atorvastatin, but not placebo, reduced serum 27-OHC by 31.5% (p = 0.001). This was deemed to be a high quality (20/22) study, despite being a short-term trial that did not consider any clinical outcome parameters and failed to clarify the long-term impact of cholesterol-lowering agents on disease severity. A phase II therapeutic study of atorvastatin, chenodeoxycholic acid, and resveratrol was carried out in 12 SPG5 patients. Although well-conducted, the quality of this study was deemed to be moderate (9/22) due to the absence of randomization and blinding. Collectively, these studies offer the first illustrations of a causal treatment strategy in the SPG5 form of HSP. However, aspects still needing to be investigated include the clinical efficacy of cholesterol-lowering drugs and the question of whether biochemical parameters reflect neurological impairment in vivo. On the other hand, these preliminary data suggest that it would be useful to evaluate the long-term effects of these drugs in SPG5. The literature search revealed two case series of patients with complicated HSP who showed clinical improvement after treatment with betaine and vitamins. In the first report, Four patients were described four patients. All patients were treated with vitamin B12, folic acid, folinic acid, and betaine anhydrous. Betaine treatment resulted in a rapid and sustained reduction in homocysteine levels in all the patients and, over a period of nine to 15 years, improved the conditions of three of them. However, no objective clinical tools were used to assess efficacy. The second report described two adults treated with betaine, folinic acid, vitamin B12, vitamin B6, and ASA as prophylactic agents. One year after starting treatment, their SPRS score decreased from 14 and 15 to 12, respectively. Overall, these clinical studies suggest that betaine and vitamin supplementation may be useful in the rare cases of HSP caused by MTHFR deficiency. However, they were open-label and uncontrolled studies, and their quality was rated as very low. No RCTs have been conducted to assess the effectiveness of electrical stimulation in HSP treatment. A single published study met the inclusion criteria for this review. The case report in question described a 26-years-old man whose motor function improved after treatment with electrical stimulation of the quadriceps and anterior compartment musculature two to three times per week for 3 months. Gait analysis performed revealed a 27% increase in velocity, associated with increases in cadence, and right step length. The quality of this case report was rated as very low. One uncontrolled trial aimed to test the effectiveness of a robotic-aided intensive training program in adults affected by pure HSP. The study included 13 adult patients undergoing rehabilitation treatment (three sessions per week for 6 weeks). At the end of the treatment, statistically significant improvements were observed in some measures, including quality of life. The quality was rated as low. One study described the outcome of robot-assisted gait training combined with physiotherapy in a 28-years-old man with pure HSP. This patient underwent 25 training sessions over a period of 6 weeks, after which functional assessments showed some minor improvements in walking speed and balance. The quality of this case report was considered to be very low. The effectiveness of hydrotherapy treatment in improving locomotor function in patients with late-onset HSP was evaluated in a small, uncontrolled trial. Nine HSP patients underwent a 10-week course of hydrotherapy based on 45-min sessions of treatment. Significant pre- vs. post-therapy differences were observed in some measures, and the integration of these measures provides some insight into locomotor inefficiencies and compensatory gait strategies implemented by individuals with HSP. The design of this short-term trial was poor and the study was deemed to be of low quality. There exist no clear indications on appropriate types and timing of physical therapy in HSP. One report described two adult siblings with HSP who underwent an intensive 8-weeks stretching, strengthening, and functional exercise program, administered in 60- to 90-min sessions (daily, 6 days/week). All measures showed improvements at the end of the intensive treatment program. Although the results of this study appeared promising, it lacked precise data on the improvements reported. Its quality was rated as very low (2/22). Baclofen is a muscle relaxant and antispastic agent that acts by activating GABAB receptors. It can be administered orally or intrathecally. Intrathecal baclofen (ITB) has greater therapeutic efficacy and less systemic toxicity compared with oral preparations. In an open study, 14 out of 16 adult non-responders to oral antispastic drugs were implanted with a pump for intrathecal administration of the drug. The treatment was found to reduce lower limb spasticity in all the patients. Walking ability was improved. The quality of this study was rated as low showing that there is still a lack of recommendations on the use of ITB in HSP. Selective dorsal rhizotomy (SDR) is a neurosurgical procedure serving to selectively destroy problematic nerve roots in the spinal cord. It can be used to relieve spasticity in cerebral palsy, but has also been tried in HSP. In an uncontrolled prospective trial, four adults with an undefined form of HSP underwent the procedure. The average score improved after treatment, with no significant difference between the scores at 1 and 2 years after SDR. Lower limb spasm scores also improved significantly. All these improvements remained stable throughout the follow-up period, with no local or general complications appearing in any of the four patients. Overall, the quality of the study was considered low. A retrospective study of four HSP children who underwent SDR was reviewed. All the patients showed reduced lower limb spasticity after the procedure, and this change was maintained over long-term follow-up (range 44–252 months). However, progressive functional decline was observed in two siblings diagnosed with the infantile-ascending form associated with mutations in ALS2. This study was rated low quality (2/22). No recommendations on new therapies are emerging, and it is depressing to note that these patients continue to be treated in the same way as they were in the “pre-genetic era.” In short, symptomatic treatment remains the cornerstone of HSP management. As things currently stand, few trials have evaluated specific HSP treatments, while there is a paucity of robust clinical trial data supporting the efficacy of even the most widely used symptomatic drugs. There is no doubt that the search for an effective treatment for HSP needs to be stepped up. At present, several preclinical avenues of research are offering interesting findings that may open the way for specific pathogenetic therapies in selected forms of HSP and promising data are begging to be used to improve clinical efficacy. Tests or scales adopted to measure fatigue and quality of life might serve in general in HSP but could be inappropriate in more complex setting or in young children. Today well-designed clinical trials of symptomatic drugs for HSP treatment are clearly lagging behind. There is a need for RCTs with sufficiently large samples and precise biological outcome measures, to evaluate the efficacy of the treatments already in use in current neurological practice. Rare disease day is here again, and I'm very pleased to be able to publish the results of my sixth survey. This survey was launched in the autumn of 2018, and once again I have had a fantastic response from people around the world completing the questions and contributing to my analysis of HSP. This survey repeats some of the questions asked in my original 2013 survey, and offers the opportunity to look at some results longitudinally. This survey also marks another new variation. I used Google Translate to translate the questions into other languages to allow people who do not speak English to complete the survey. I also used Google to translate their answers into English for this analysis. There were 304 respondents who completed the survey, predominantly from the USA, UK and Brazil. A brief analysis shows that 97 people who completed this survey had also completed at least one of my previous surveys, representing about a third of respondents. A small number of people, five, have completed all six surveys. There are 14 respondents who completed both the 2013 survey and this 2018 survey. There were 156 respondents (51%) who knew which type of HSP they had. SPG4 and SPG 7 are the most common types of HSP, with SPG11 taking third place. Around one third of respondents had been diagnosed with another condition before HSP. These results are similar to those found in the 2013 survey – where Multiple Sclerosis and Cerebral Palsy were the most frequent misdiagnoses. A small number of people report having HSP along with Ehlers Danlos Syndrome, Ataxia or Parkinsons. Several people listed pain, bladder and bowel issues as other long-term health conditions. It is not clear if these are symptoms of HSP or separate, different health conditions experienced by those people. Whilst more than half of these people listed one other condition, a third listed two or three other conditions, and the remainder (less than 10%) had between 4 and 7 other long-term health conditions. This analysis shows that some people may have much more complicated journeys managing the symptoms and effects of multiple long term heath conditions. In order to assess the wellbeing of people with HSP respondents completed the Warwick-Edinburgh Mental Well-being scale (WEMWBS). The average wellbeing score is 45.9, which is the same average score as shown last year. The average is lower than UK population norms, however it is still within the “average” definition and is also similar to those with a self-perceived health status of “poor”. The average score for those with HSP answering this survey is more than 5 points below the UK population norms (51-52) suggesting a significant effect. There was no significant difference in wellbeing for those people who have additional long-term health conditions compared with those who do not. Those who have SPG4 tended to have a slightly better wellbeing than those with SPG7, the two biggest groups, but neither average is more than 3 points from 45.9. Although it is a small sample size, those with SPG11 appear to have a lower wellbeing score, with their average being 40.4. Noting the small sample size, this effect might be significant. Just over half of respondents use walking sticks/poles/crutches/ canes and almost two fifths use wheelchairs/mobility scoters and walking frames/rollators. FES is the mobility aid used by the least number of people, with a take-up of less than 5%. Broadly these results are similar to those from previous years. Table 8 shows these results, including the percentage of respondents. In the remainder of this paper, whenever “sticks” are referred to as a mobility aid, this term includes poles, crutches and canes. Whenever “frames” are referred to this includes both walking frames and rollators. Whenever “chairs” are referred to this includes both wheelchairs and mobility scooters. Whenever AFO is referred to is includes both orthotics and AFO. This shows that there is a wide range of mobility aids used by the respondents to the questionnaire, covering all mobility scores. Overall the results are similar to previous years with broadly an even split between bands. Up to around 20% of patients may experience significant changes in mobility over a five year period, which is a similar result to last year. These results also show that the quicker a persons change in mobility the lower their wellbeing is likely to be. With respondents completing both surveys over 4 or 5 years this allows an analysis of change over time without having to rely on peoples memory for the types of mobility aids they were using five years ago. Some have gradual changes over a number of years, whereas others have step changes such that all of the change occurs between two adjacent years. These results show there is a greater proportion of people with a low change in mobility over a four or five year period, and that correspondingly there a fewer with medium or high changes in mobility. The 2013 survey asked people to identify how much each of 13 different HSP symptoms affected them. For this survey the list has expanded to 36 symptoms, and respondents were asked to identify how each affects them, selecting from a list of answers, which have been grouped together to aid the analysis. Table 5 lists all the symptoms in the questionnaire, ordered by how people are affected by them, with the first symptom being that which affects the highest number of people the most. The first key observation is that there are people who are affected all or most of the time by every one of the symptoms listed. The first five symptoms (loss of balance, muscles being stiff and difficulty running, walking, using stairs) all relate to mobility and affect almost everybody. Of all of the other symptoms there are people who do not have these symptoms. This table shows that fatigue is the symptom which has the greatest effect for the greatest number of respondents. Difficulty walking and loss of balance affect a smaller number of people, but still more than 50. Finally, muscles feeling stiff, bladder problems and back/hip pain affect approximately 40 respondents the most. The majority of respondents answered both symptom questions and wellbeing questions. This allows an examination of which symptoms have the greatest effect on wellbeing. The assessment has been limited to those answers where at least 30 respondents had given their wellbeing score. Three of the symptoms show significant effects and a further three symptoms show effects which may be significant. Symptoms which may be significant have been selected where the wellbeing score consistently decreases with increasing symptom effect and where the highest and lowest wellbeing score are more than 3 points from the average. This table shows that depression and stress have the greatest effect on wellbeing. For both symptoms, those that have it all or most of the time have a significantly lower wellbeing score, and those that don’t have it have a significantly higher wellbeing score. For cognitive effects, those that have these all or most of the time have a significantly lower wellbeing score and those that don’t have these have a higher wellbeing score, but the effects may not be significant. For poor co-ordination, regular falls and back/hip pain there is a large range of wellbeing between those that have these as a major symptom and those that do not have, however the results may not be significant. Altogether this is 21 of the 36 symptoms identified. 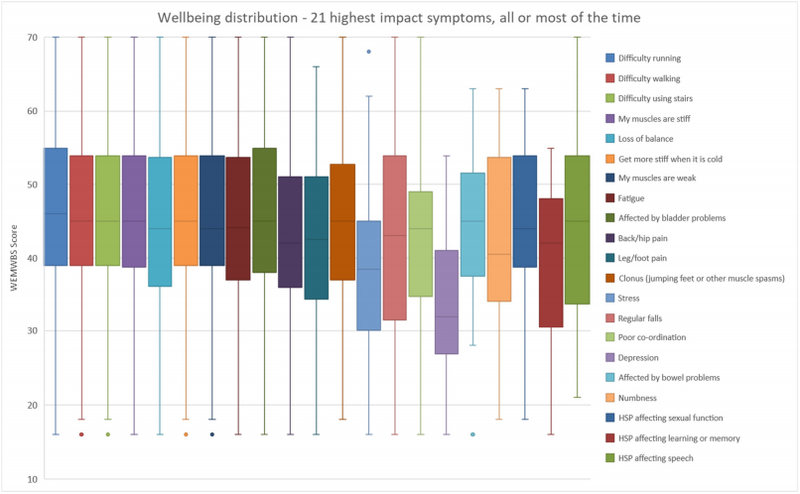 Of the 21 highest impact symptoms considered, all respondents had at least 5 and no respondents had more than 18. Across the mobility bands the number of symptoms tends to remain broadly the same. With reduced mobility the effect of symptoms increases. In the early stages there are more symptoms with a minor effect, whereas further along the HSP journey there are more symptoms with a major effect. The progressive use of mobility aids seems to coincide with an increase in the severity of symptoms. This finding is different from that identified in the 2013 survey. In the 2013 survey the analysis showed that there was an increase in the number of symptoms with increased use of mobility aids. The 2013 analysis showed that those who walk unaided tended to have no major symptoms, whereas this survey indicates that 25% of symptoms are major. There are two likely potential reasons for this change. Firstly, the list of symptoms has increased from 13 up to 36, which perhaps indicates that the 2013 survey was not capturing the full picture of peoples symptoms. Secondly, the symptom list now includes general items like “I have difficulty walking” or “my muscles are stiff” which are perhaps likely to be noticed by someone in the earlier stages of HSP. It is interesting to observed that fatigue is the factor which is singled out by respondents as having the greatest effect, however depression is the symptom which the greatest influence on wellbeing. 13 respondents completed the symptoms questions of both this survey and the 2013 survey. The 2013 survey examined 13 symptoms and this analysis identifies changes in those 13 symptoms. These respondents fall into two groups. The first group, comprising 4 respondents report as being affected by the same symptoms in 2013 as 2018. On the whole these people report that some of the symptoms have gotten worse over the five year period whereas others remain the same. Interestingly, some symptoms are better for some people. The second group, comprising 9 respondents, are those who have identified at least one new symptom over the five year period. Of the symptoms which were identified in 2013, some have stayed the same and some have gotten worse. Like the first group, some symptoms have got better for some people. This analysis presents a different picture to that presented in 2013. In 2013 it appeared that the number of symptoms would increase with decrease in mobility, and that symptoms would similarly increase in their severity. Viewing changes in symptoms for one person over a five year period this shows either that some symptoms are intermittent or their perception of some symptoms varies from year to year. This longitudinal analysis shows that overall the number of symptoms does tend to increase over time, but not all symptoms persist from year to year. Where a respondent indicates that that factor affects them usually or always it is indicative that they have an issue which affects their sleep quality. 290 respondents answered at least 14 of the sleep questions and are included in this analysis. The following table identifies how many of the 16 different sleep issues respondents have, i.e. where they are affected usually or always by that factor. The majority of respondents are affected by at least one sleep factor. Approximately half of respondents are affected by 3 or more factors, and approximately half are affected by up to 2 factors. Grouping the factors together allows the number of sleep factors to be compared with wellbeing. Those respondents affected by at least 6 factors, approximately one quarter of respondents are shown to have a significantly lower wellbeing. Those who are affected by no factors or one factor, about a third, have a better wellbeing, but this effect may not be significant. Examination of the data allows the importance of the different sleep factors to be identified. Did you have difficulty falling asleep, staying asleep, or feeling poorly rested in the morning? Did needing the toilet disturb you in your sleep? Did pain disturb you in your sleep? Did you fall asleep unintentionally or have to fight to stay awake during the day? Did other physical symptoms disturb you in your sleep? Did worries disturb you in your sleep? Did other factors disturb you in your sleep? Did medications disturb you in your sleep? This table shows that the factor with the greatest effect, affecting nearly half of respondents is having difficulty falling asleep, staying asleep or feeling poorly rested in the morning. Needing the toilet in the night affects more than a third of respondents and having repeated rhythmic jerks or twitches affects about a third of respondents. 93% of respondents usually or always sleep in a bed, and 1% of respondents usually or always sleep in a chair. The majority of the remainder of respondents indicate that they sometimes sleep in beds and sometime sleep in chairs. A small number of respondents indicate that they never sleep in a bed and also never sleep in a chair, and conversely one person indicated that they always sleep in a bed and they also always sleep in a chair. None of these respondents provide any further details, aside from one respondent preferring to sleep on the floor. For the question “Do other factors disturb you in your sleep?” a range of different answers were given, some of which matched the other questions whereas others included disturbance from a range of factors including light, noise, temperature, pets, children, animals and other people. There is no significant variation in sleep factors with mobility score, indicating that sleep factors are generally independent of mobility aids used. The sleep factors have been examined to identify if any have an effect on wellbeing. When reviewing this data it is not clear if a sleep factor affects wellbeing, or if wellbeing affects sleep, or if both sleep and wellbeing are affected by another factor. Those whose sleep is disturbed by feeling sad/anxious, by medications or by worries have a wellbeing which is significantly below average. Those whose sleep is not disturbed by feeling sad or anxious have a better wellbeing, but not significantly. This factor is similar to depression being the overall HSP factor with the greatest effect on wellbeing. Respondents selected the response which closely matched their situation for the six activities of daily living, as set out using the Katz Index of Independence in Activities of Daily Living (ADL). For each activity a respondent scores one point if they can undertake that activity independently and no points if they cannot. Overall, a high score of six shows that the person is independent, and a low score of zero shows that the person is very dependent. Over half of respondents score six points and are fully independent, and that over one third score five points. The most common factor affecting people is their continence, their control of bladder or bowel. Of the 84 of respondents who score 5 points, 74 are affected by the continence factor, with bathing (5 respondents) and dressing (four respondents) being the other two main factors. Of the 16 of respondents who score 4 points, the most common combination is continence and bathing, with 9 respondents. Four respondents are affected by continence and dressing factors, and two are affected by bathing and dressing factors. There are no clear patterns between the ADL factors and the use of mobility aids. There are people with 1 point,2 points and 3 points right through the range of mobility aid use. Similarly there are people affected by continence, bathing, dressing and toileting factors throughout the range of mobility aid use. Most of those who answered the ADL questions also answered the wellbeing questions. The results suggest that having one or two factors is not significantly different from having no factors. Where a respondent has 3 or more factors their wellbeing appears to be significantly lower, although this is a small sample size. Looking at the factors individually, those who are affected by continence or transferring factors have a wellbeing which is not significantly different from average. Those who are affected by the bathing factor have a lower wellbeing, but perhaps not significantly. Those affected by dressing and toileting factors have a significantly lower wellbeing, although this is noted as being a small sample. Around 60% of respondents are members of a support group and 40% are not. The most common type of support groups identified were Facebook groups. Three key benefits people get from group membership are; getting to know other people with HSP, getting knowledge about HSP, and sharing stories. There is no difference in wellbeing between those that are members of support groups and those that are not. The most common reasons given for not being in a support group were there not being a group near where respondents lived, not being aware of any support groups and not feeling the need to be a member of a support group. There is no difference in wellbeing between those that are members of support groups and those that are not members of support groups. Half of respondents track their symptoms and half do not. Almost all of those who do track symptoms described how they track those symptoms. The most common methods were; records produced by medical professionals, reviewing how things have changed from time to time and keeping a record/diary/log. There is no difference in wellbeing between those that track their symptoms and those that do not. Throughout this study the different factors which have been shown to have the greatest link with wellbeing have been identified. The tables below draw together the factors which have the strongest link wellbeing, either positive or negative. The number of respondents given is the total number which have or don’t have the factor, irrespective of if they gave a wellbeing score. The factors below have been identified as having a wellbeing which is better than average. The factors below have been identified as having a wellbeing which is significantly lower than average. Results with a small sample size (less than 20) have been put in brackets. Four of these symptoms are related to mood; depression and stress overall, and sadness/anxiety and worries affecting sleep. Those who do not have depression or stress overall have a significantly higher wellbeing. Many of the factors in these tables are not connected with mobility or other factors which are directly related to HSP. These factors may not form part of routine discussions with medical professionals which frequently focus on mobility, pain, continence and the other direct factors. It is important to remember that it is possible to take action to improve some of these other factors. It is not necessary to accept, for example, that people are depressed, or cannot sleep well. Help or treatment is available for some factors, and getting such help/treatment may result in an improvement in wellbeing. Wellbeing is not solely about health and examining your HSP progress and symptoms. Improvements in wellbeing can be made in other areas, including friendships, hobbies, learning new things, being kind and being mindful. First and foremost I need to thank all of the respondents who took time to respond to this survey, without these excellent answers this analysis would not be possible. Special thanks are due to the Brazilian HSP group, ASPEH (https://www.aspehbrasil.org/) who took my Google translations one step further and hosted their own copy of the questionnaire in Portuguese. Many HSP groups on FaceBook, whose admins I thank for letting me post about this.